Early Girl. Better Boy. Heirloom. Beefsteak. So where have I been? I thought I knew about and have tasted just about every tomato known to mankind until I ran into Samantha and Tessa from Penn Farms in Colonial Beach Virginia, at the Great Falls Farmers Market. 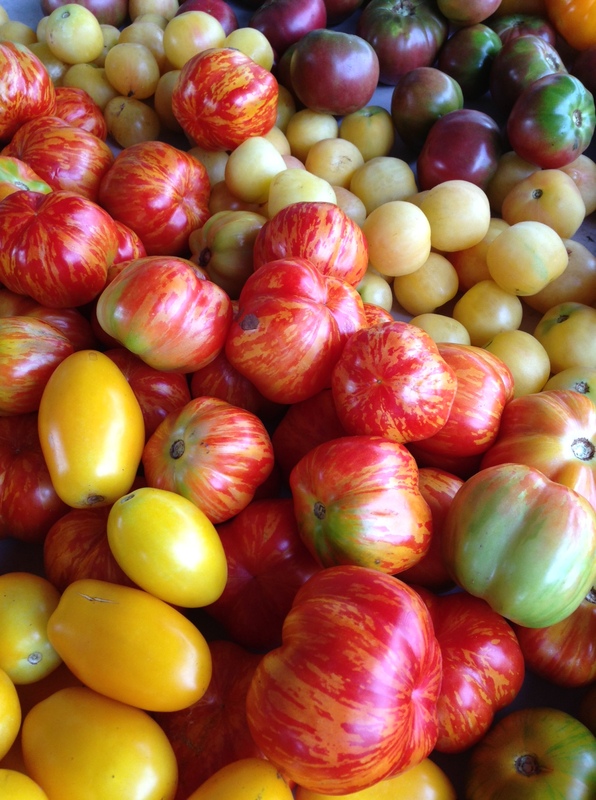 What is a Cherokee Purple Tomato? The Cherokee Purple did not disappoint. Today I had them for lunch, sliced with a little salt, fresh basil, some mayo, and a piece of toast for dipping into the tomato juice left on the plate. 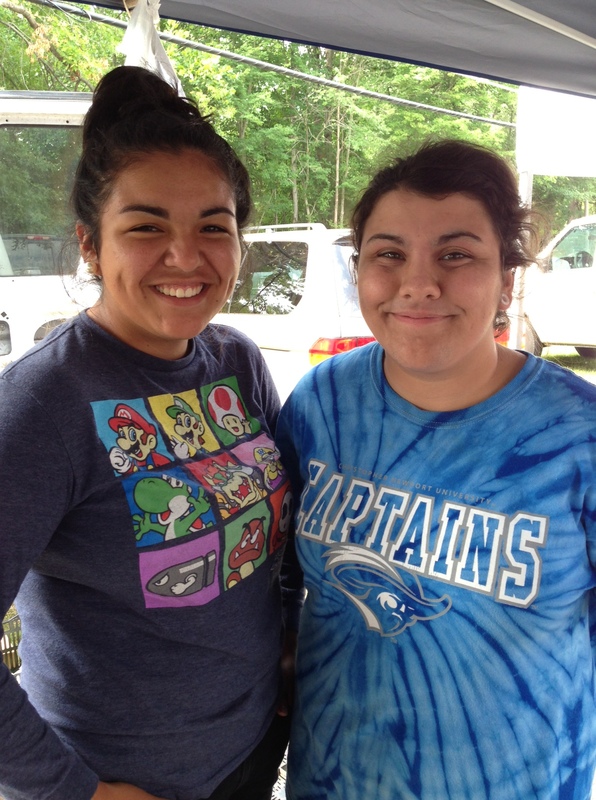 Samantha (left) and Tessa (right) are pretty cheerful early on a Saturday morning at the Farmer’s Market in Great Falls. They also know their produce. As I pointed to all the tomato varieties they quickly rattled off their names. Thanks to them, I’ve now experienced the Cherokee Purple. They also introduced me to squash blossoms which is a topic for a later blog. The variety from Penn Farms. Samantha and Tessa knew the names of all of them. 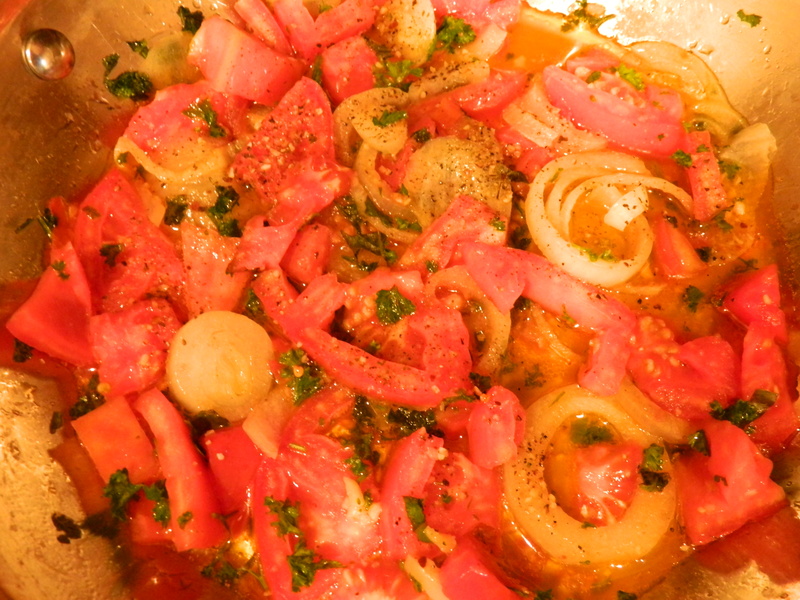 According to many sources, tomatoes are a formidable source of lycopene and antioxidants. 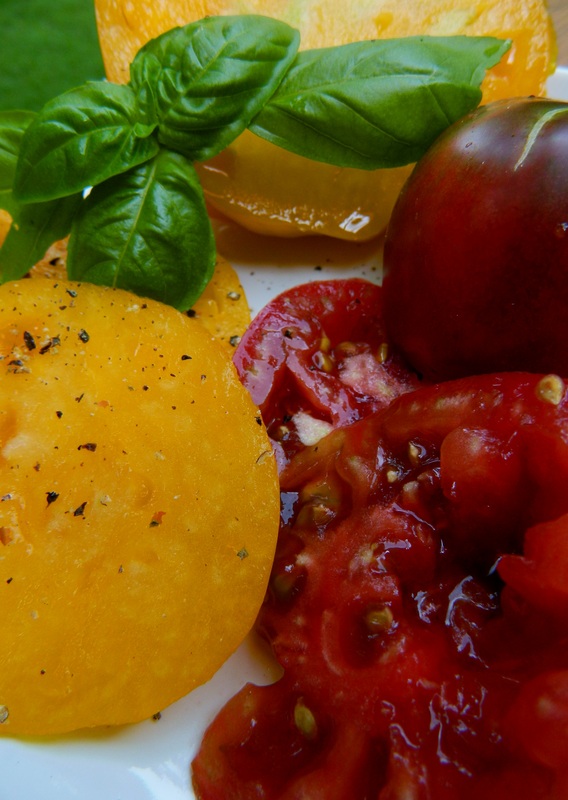 The Tomato Wellness website says tomatoes are one of the worlds’ healthiest foods. I have a friend in the south who claims that if you eat something with tomatoes in it every day you will not have a weight problem. While that theory has not been proven, it wouldn’t surprise me. It’s the best time of year to take the tomato plunge, so go ahead. It’s all good. 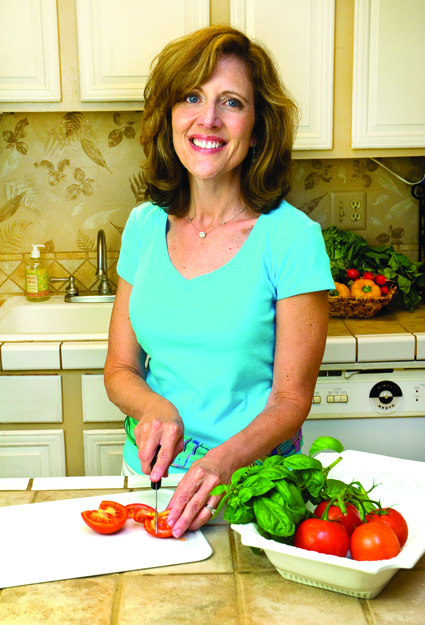 For more on my tomato thoughts, see “It’s Too Hot to Eat,” page 71 in the summer issue of Celebrate Home Magazine. Download for free here. …Outside that is. It’s time to move outside to the deck, yard, or porch. I needed a quick appetizer last night and it doesn’t get any easier or fresher than this. 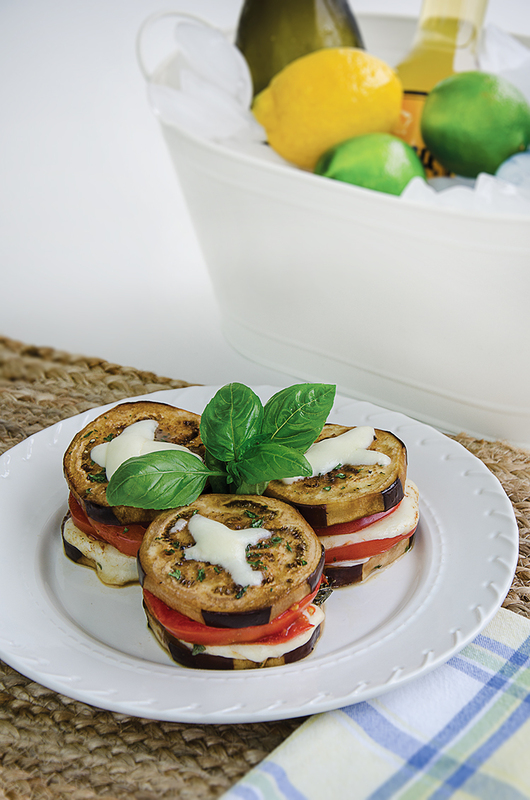 Slice French bread into thin slices and arrange on platter. 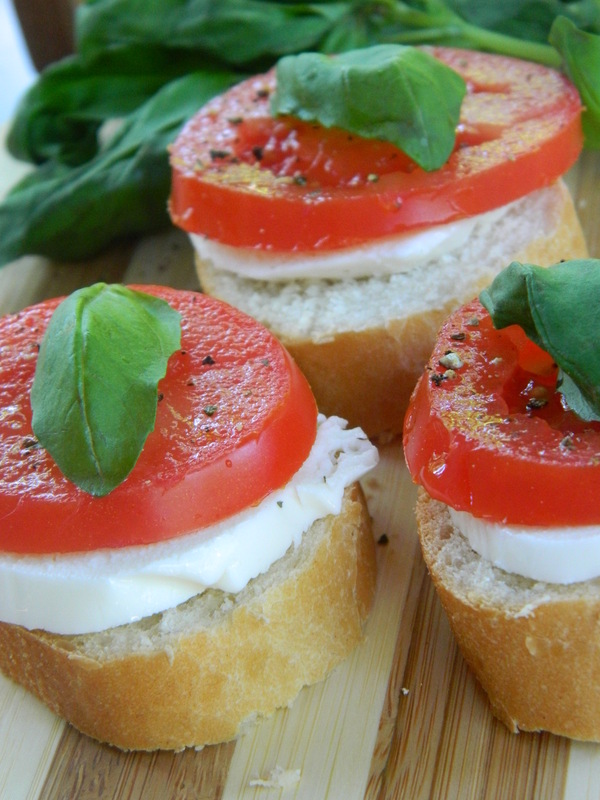 Assemble by putting a slice of mozzarella cheese, then tomato, then salt and pepper to taste, then top with basil leaf.